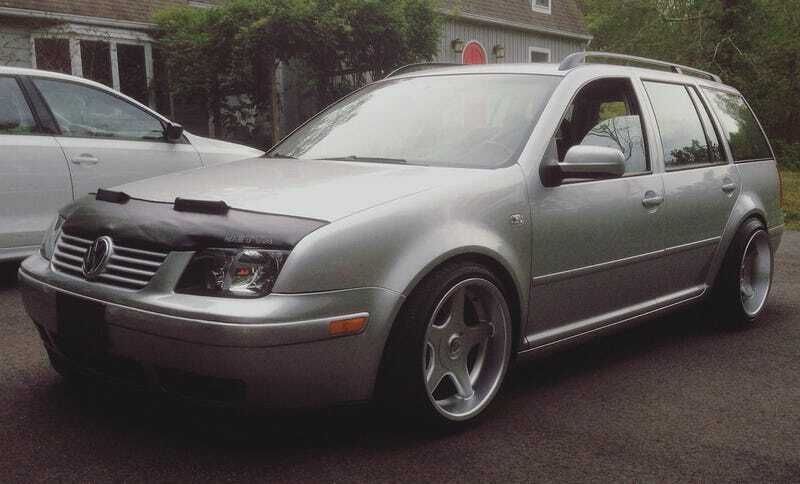 For $7,000, Does This 2003 VW Jetta Wagon Make You Unic-Horny? The seller of today’s Nice Price or Crack Pipe Jetta says its a unicorn owing to its level of kit and its low miles. We’ll just have to see if its price makes it truly a rare beast indeed. Fun fact: calling repeatedly faulty cars lemons most likely derived from early 20th century American slang where a person who was a dumbass or a loser was often referred to as a “Lemon.” Volkswagen enshrined this connection in a famous ad in which an apparently normal looking Type 1 was anointed as a lemon owing to a non-obvious flaw that was caught by one of its factory’s quality inspectors—Kurt Kroner to be precise. That preamble is in no way to be taken as suggestion that yesterday’s custom 2002 Subaru Impreza WRX was a lemon, I only bring it up because the car’s Blaze Yellow paint job and nubby vent-festooned body kit reminded me of the wrinkly and pleasingly tart citrus fruit. Another direct connection is that fully 90% of you found that Subaru’s price tag hard to swallow, and it fell in a Crack Pipe loss. What, in your opinion, is the best looking Volkswagen car ever? For me it’s the Type 3 Notch, but a close second to that is the fourth generation Jetta, both in tidy sedan and glassy wagon styles. Here we have just such a wagon, a 2003 Jetta with a breathed upon 1.8-litre turbo four and a five-speed manual transmission. Owing to those desirable options, and the cars relatively low—64,000—miles, the seller says it’s a unicorn. Now, I don’t believe that for a second. Unicorns exist in a wonderful fantasy world along with pixies, elves, and down to earth girls named Beth who are really into you. This Jetta on the other hand, appears to live in Connecticut. So it’s an old Jetta wagon with a turbo and a stick, so what, right? Well, first off, please note that the car is being offered up on the VW Vortex forums, which means that it should be considered as a very serious Vee-Dub. It comes with a bunch of expected engine enhancements, including an AEM cold air intake, side-mount interooler and red top coil packs—ahh the VW coilpacks—as well as new motor mounts, hoses, timing belt and water pump. It also has a new starter and battery. Woot! Other areas of interest are the interior where leather-wrapped 20th Anniversary Edition Recaros reign. The rest of the room looks to be in nominal shape, with only a column-mounted boost gauge distracting form the otherwise stock dash. Suspension is by way of ST coilovers and the car has been upgraded to 20th Anniversary discs all around as well. I think my favorite bit of kit in the seller’s description however is the R32 wipers. That’s sort of like saying I’ve got a Ferrari hat in my Fiat 500L. Okay, I’ve put this off long enough. Let’s talk about those wheels and tires. The seller says that the Brock B1 alloys are rare, and to be honest, Brock makes some pretty fine wheels. I’m just not all that into the look of tires stretched over too-wide wheels like you’re trying to fit a condom on an elephant so he can go out and get lucky. Your mileage may vary, as may your elephant’s. What has also varied it seems is the price, which the seller says has been lowered to $7,000 with the Brocks. He’s interested in serious buyer only, so let’s see if we think his price is just as serious. What do you think, is this “Unicorn” Jetta worth $7,000? Or, is that a price that makes this just an all-too common sighting. VW Vortex Classifieds out of Connecticut, or go here if the ad disappears. For $12,900, Does This Wild 2002 Subaru Impreza WRX Work It?